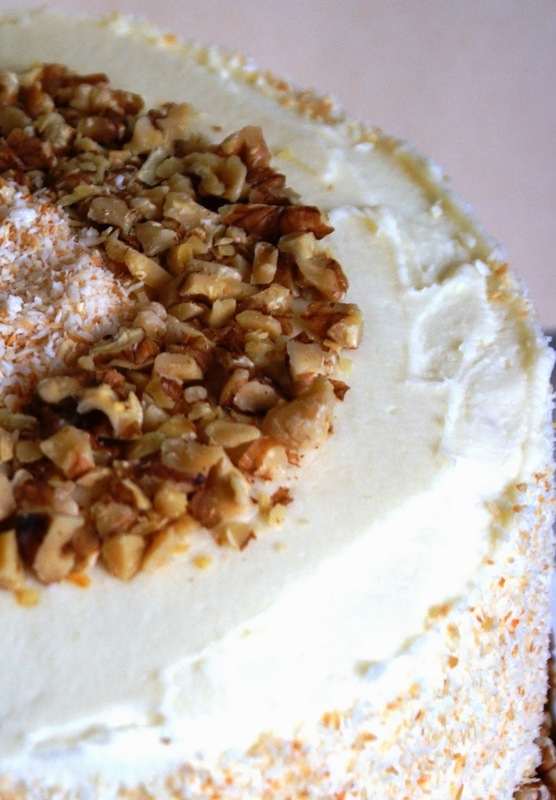 3-tier Tropical Carrot cake with Pineapple Cream Cheese frosting, and toasted walnuts and coconut for decor. 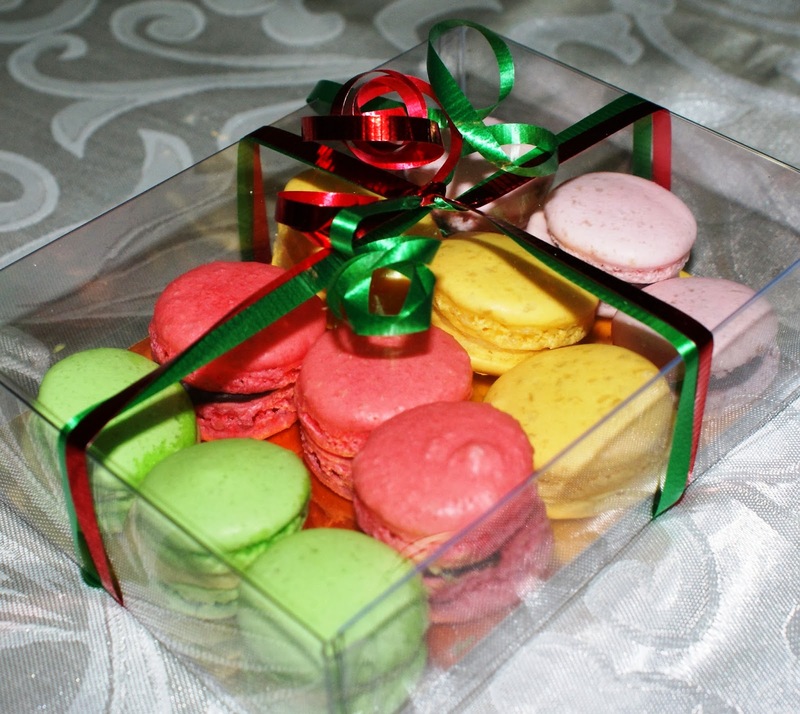 French Macarons: Pistachio, Raspberry, Lemon, and Rose. 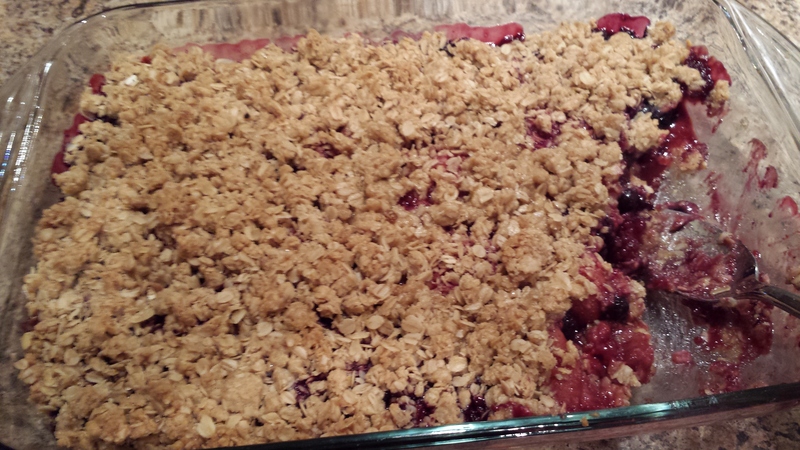 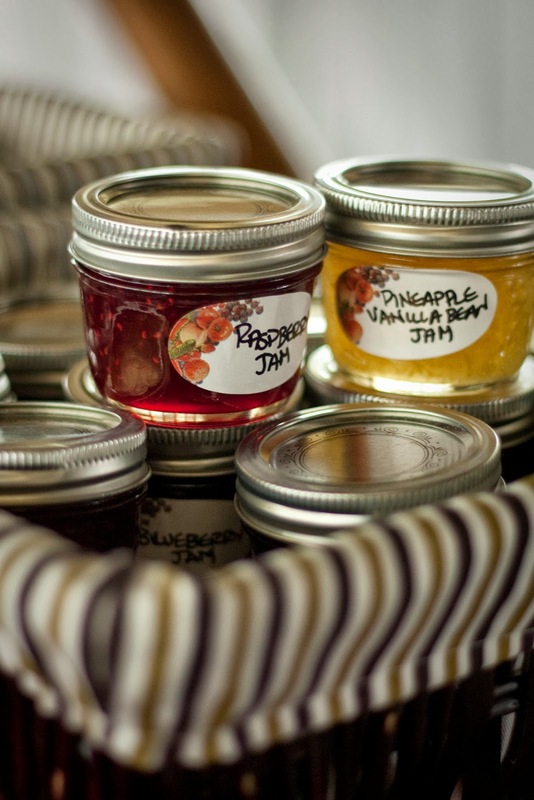 Handmade jams, jellies, and preserves: Raspberry Chambord, Bumbleberry, and golden plum. 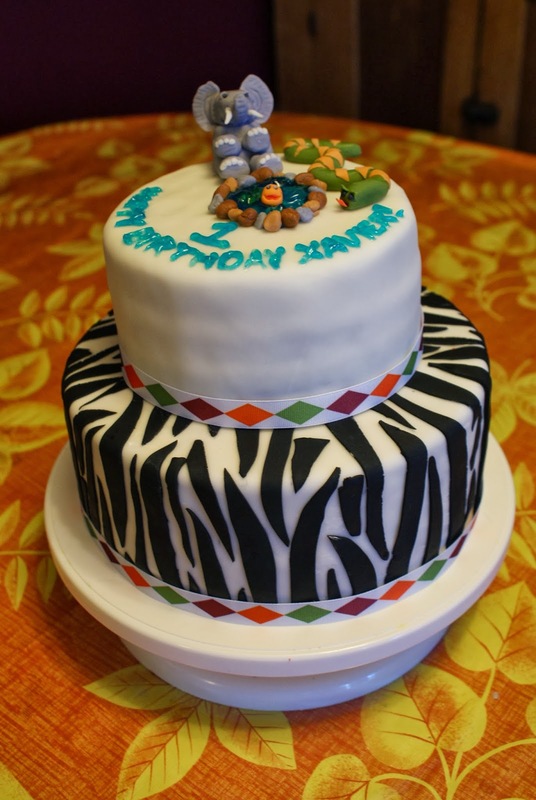 2-tier birthday cake with handmade zebra stripe pattern, and handmade gumpaste fish, snake, and elephant. 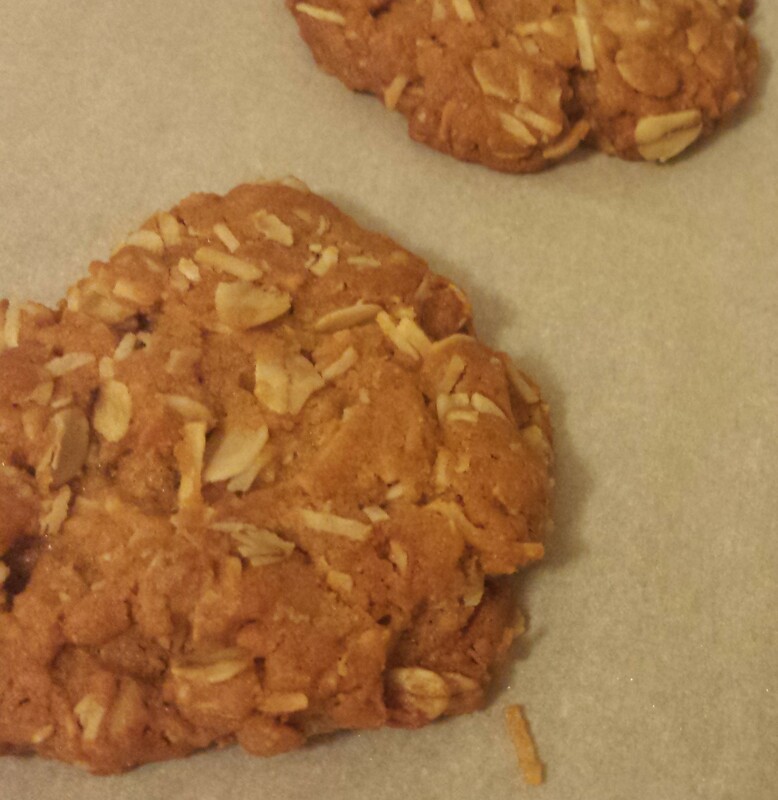 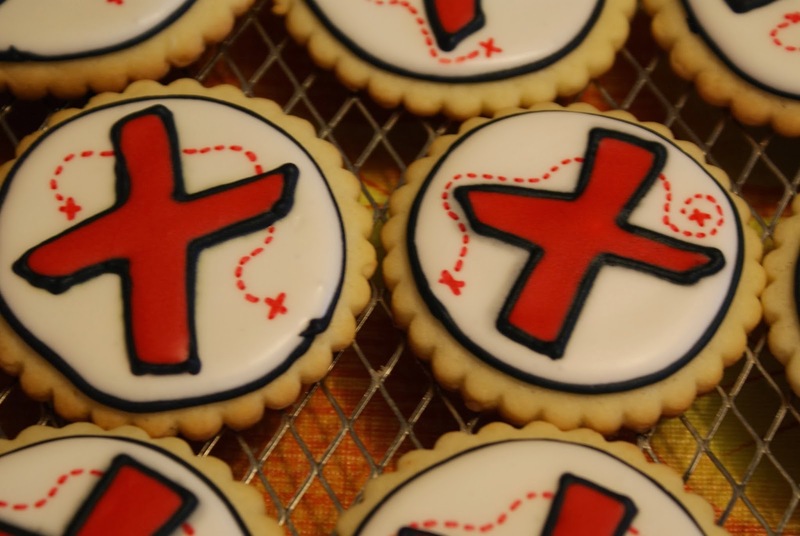 Custom sugar cookie (commercial) order. 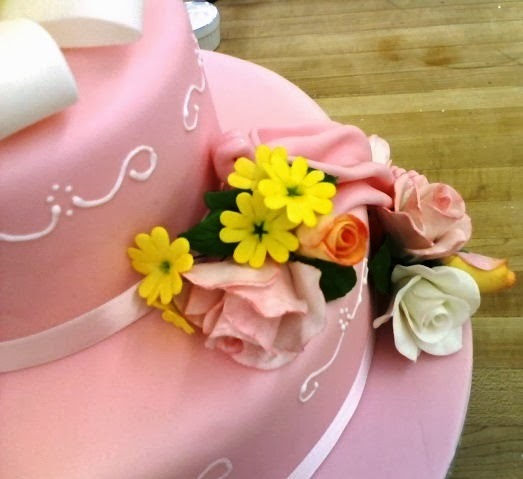 Practice wedding cake (in Pastry school) with handmade gumpaste flowers and bow – side view. 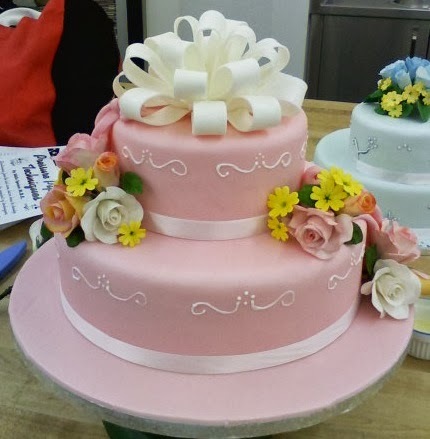 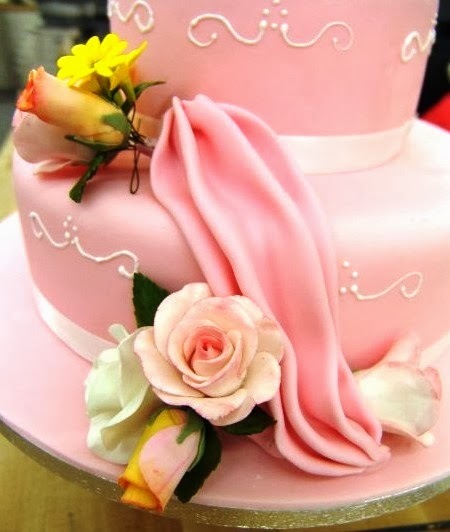 Practice wedding cake (in Pastry school) with handmade gumpaste flowers, draping and bow – side view. 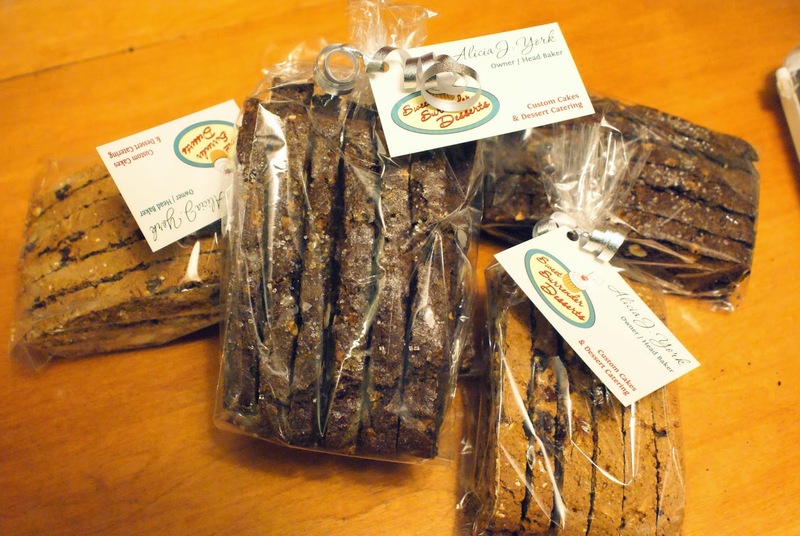 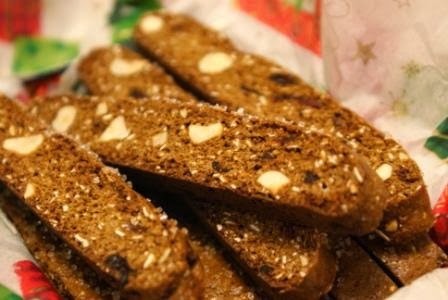 Gingerbread biscotti and Chocolate hazelnut biscotti. 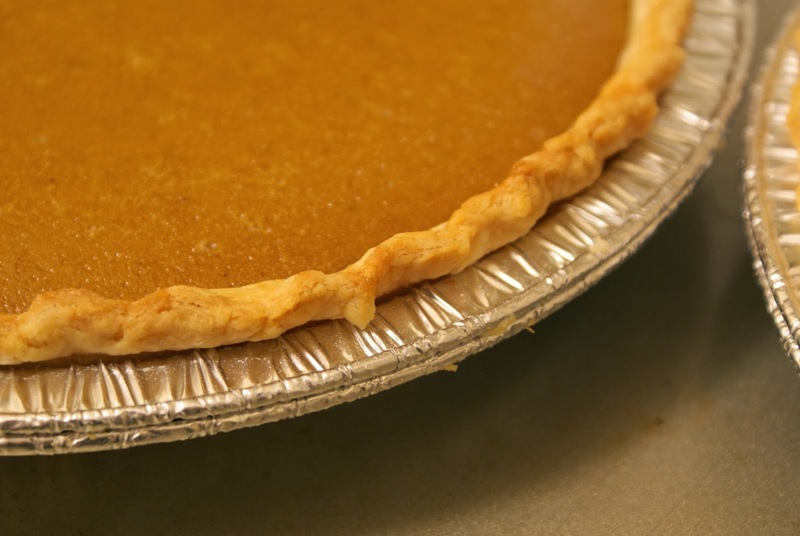 Deep dish apple butter pumpkin pies with handmade crust, homemade spiced apple butter and pureed fresh pumpkin. 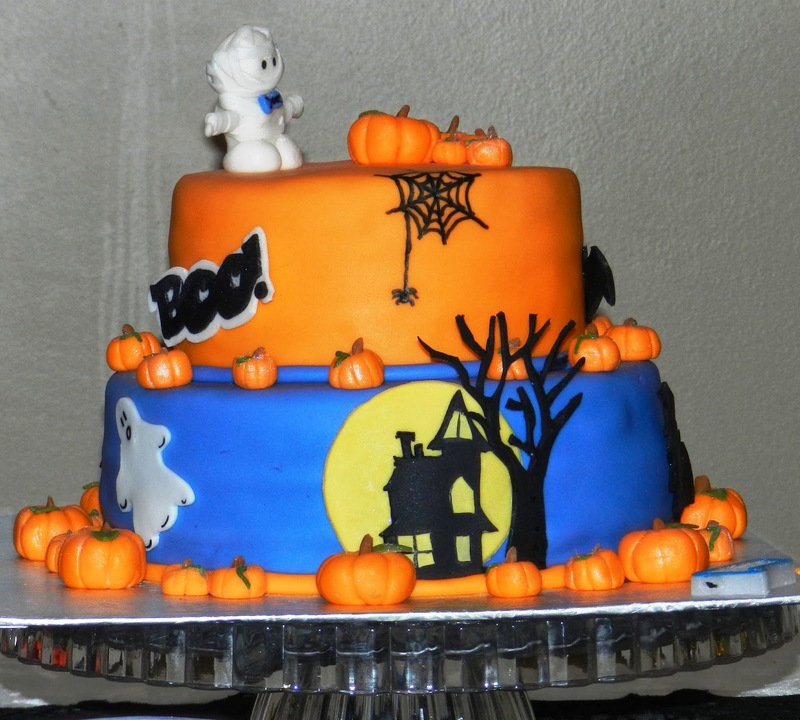 Two-tier Halloween cake with handmade gumpaste pumpkins, haunted house silhouette, bat, ghost and “Boo!” pieces, and mini mummy with bowtie. 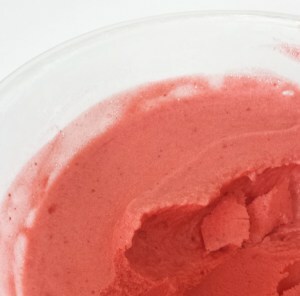 Handmade Raspberry and Pineapple Vanilla Bean Jams. 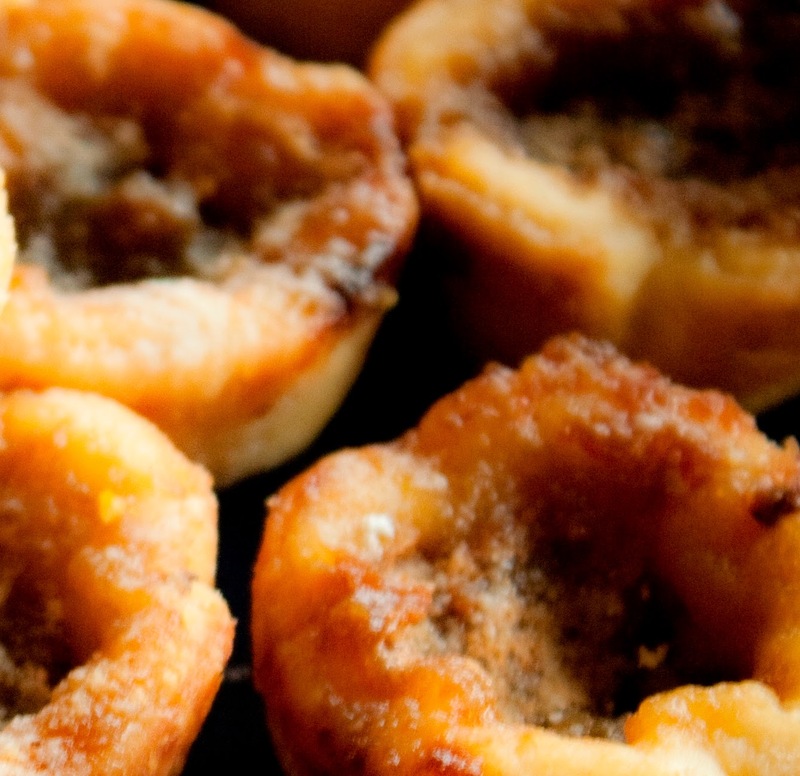 Mini Butter tarts with handmade pastry shells. 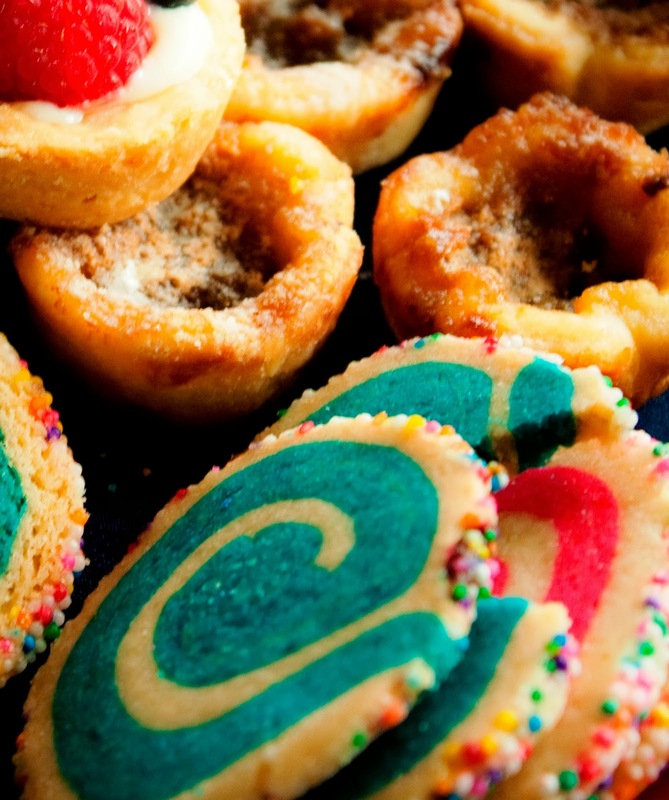 Peppermint and Cherry Swirl cookies with Lemon Cream Cheese Mini berry tarts and Butter tarts with handmade pastry shells. 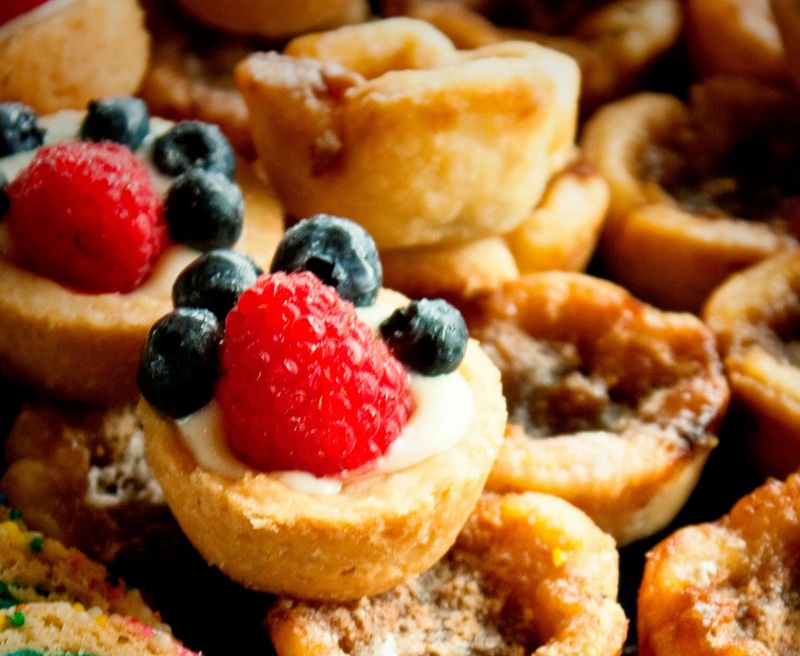 Lemon Cream Cheese Mini berry tarts and mini Butter tarts with handmade pastry shells. 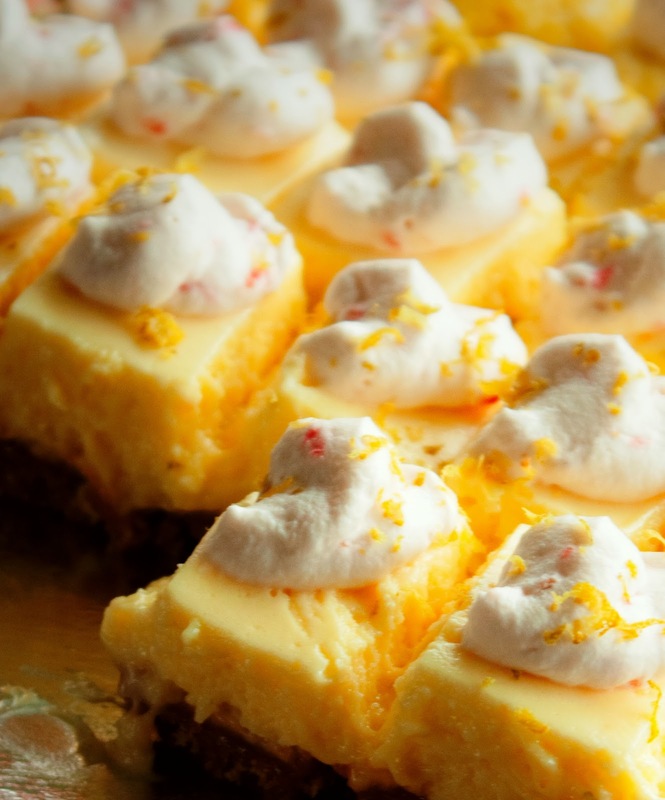 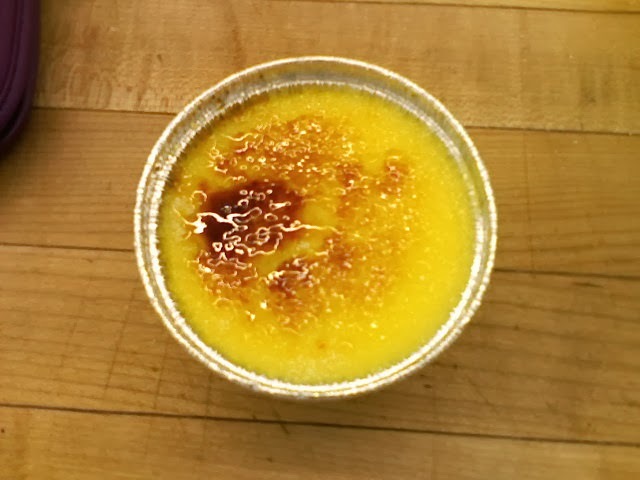 Mini Key Lime bites with whipped cream and lemon rind. 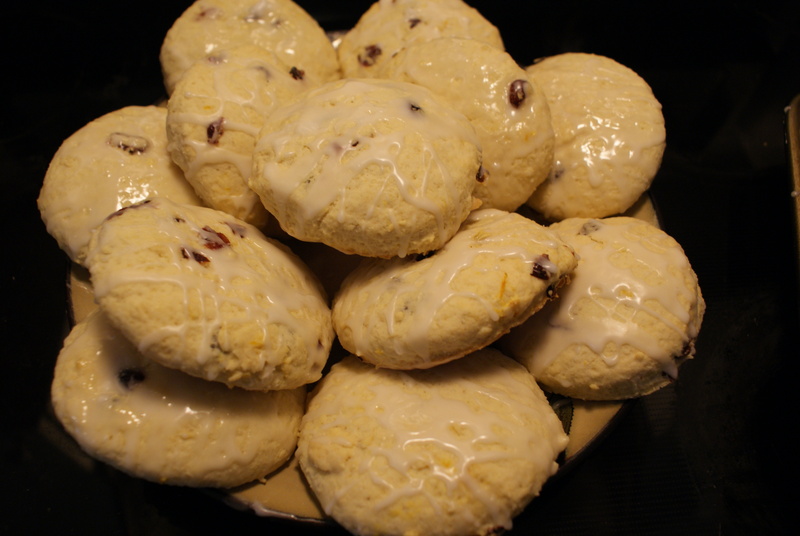 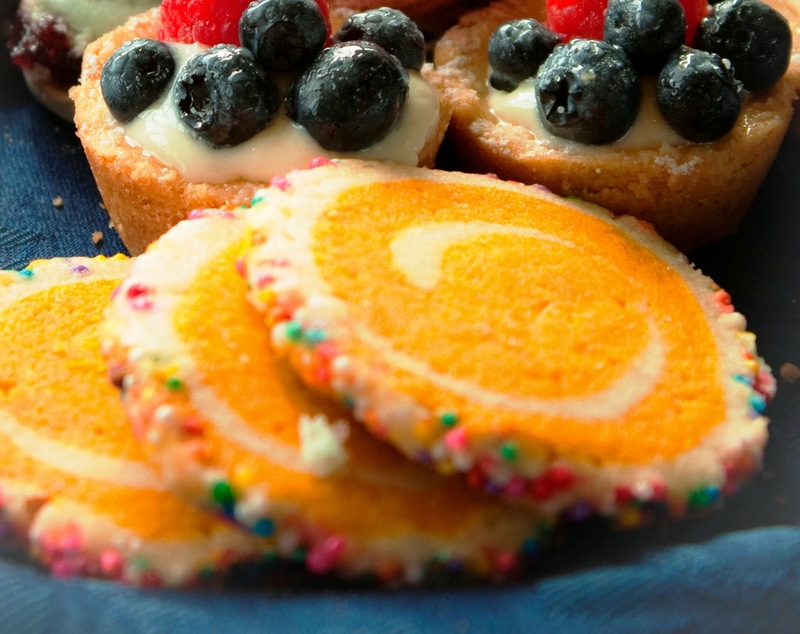 Lemon Swirl Cookies, and Lemon Cream Cheese Mini berry tarts with handmade pastry shells. 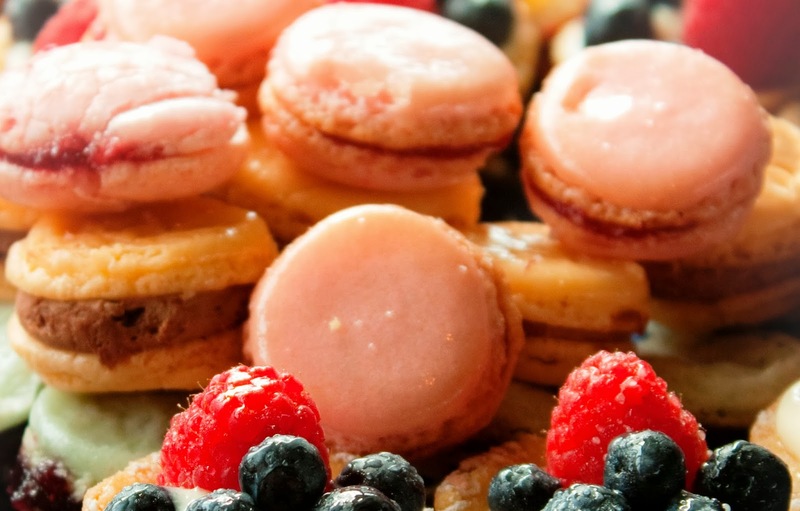 Handmade macarons: Raspberry with handmade Raspberry filling, Orange with Milk Chocolate filling, and Blueberry with handmade blueberry filling. 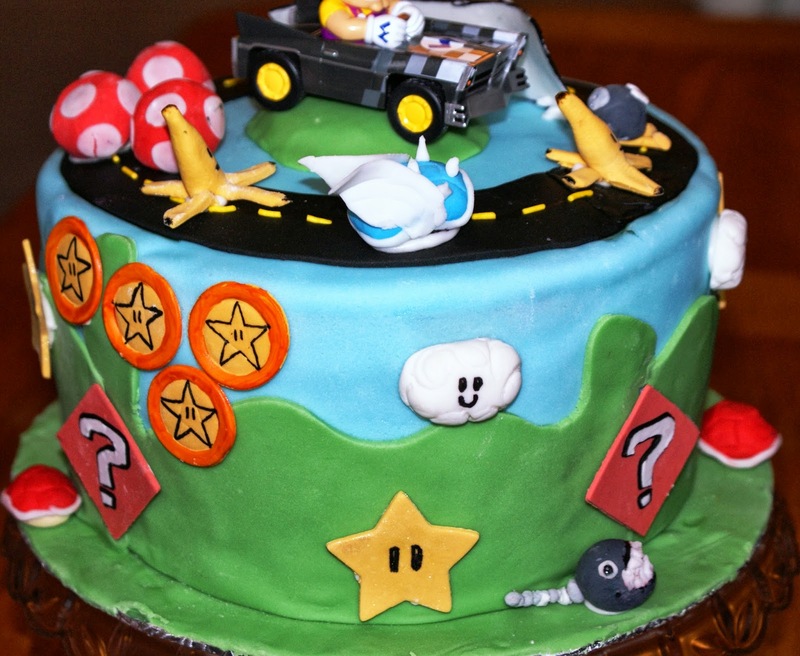 Some of the handmade gumpaste/fondant decor for Super Mario Kart cake. 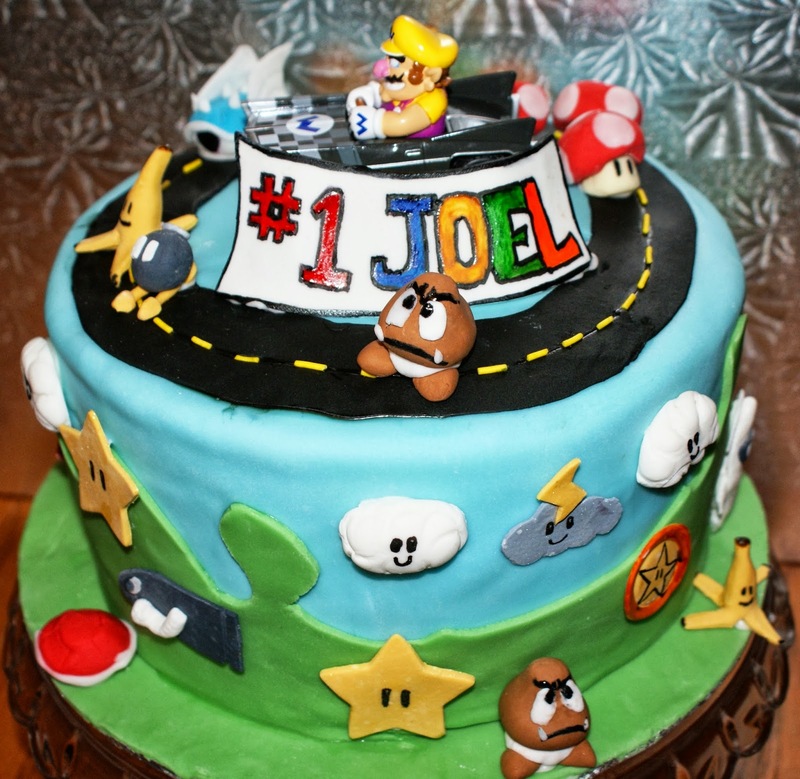 Super Mario Kart cake (one of my first!) 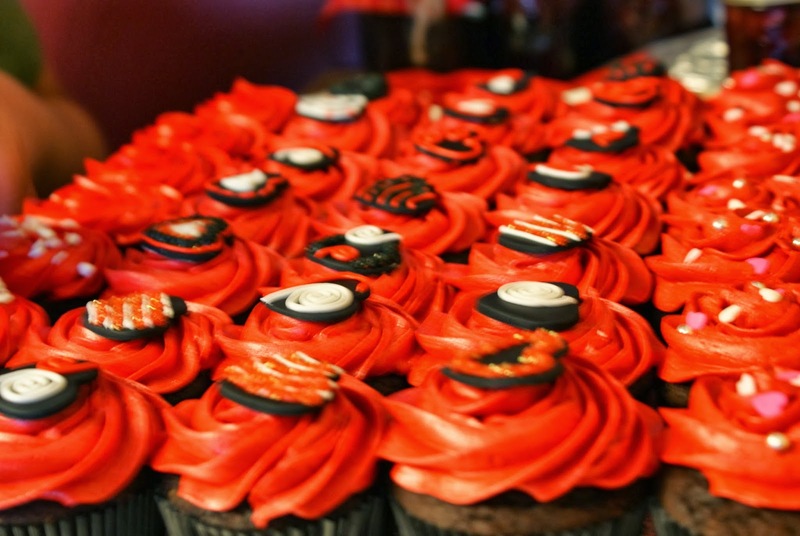 with all handmade gumpaste decor and plastic Wario toy – front view. 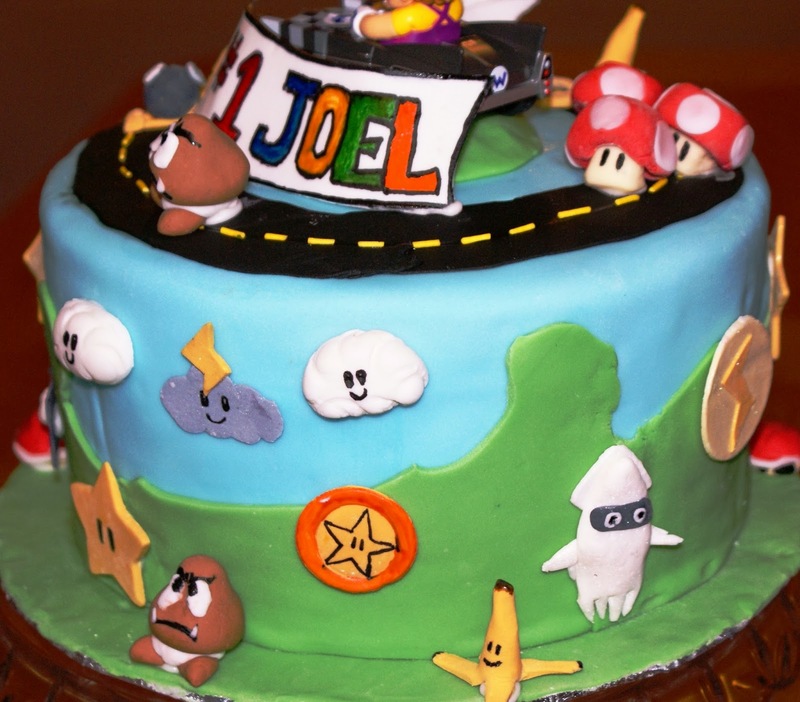 Super Mario Kart cake (one of my first!) 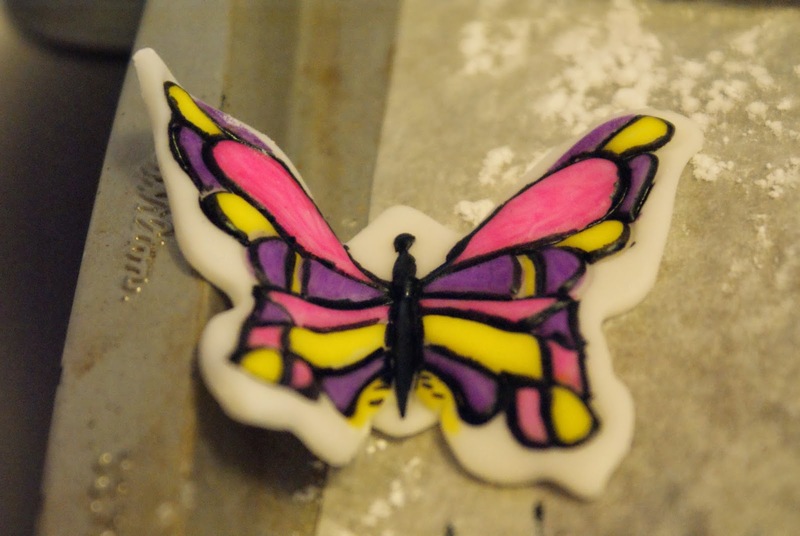 with all handmade gumpaste decor and plastic Wario toy – side view. 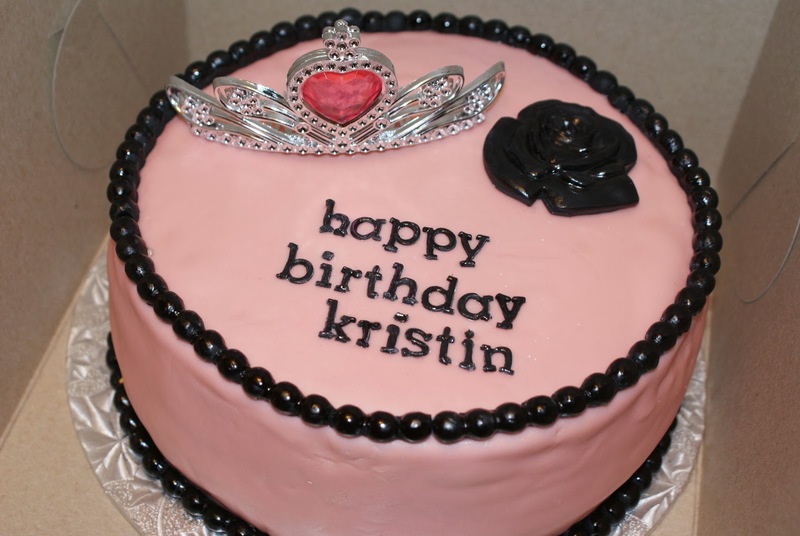 Vanilla birthday cake with gumpaste girly decor and plastic crown. 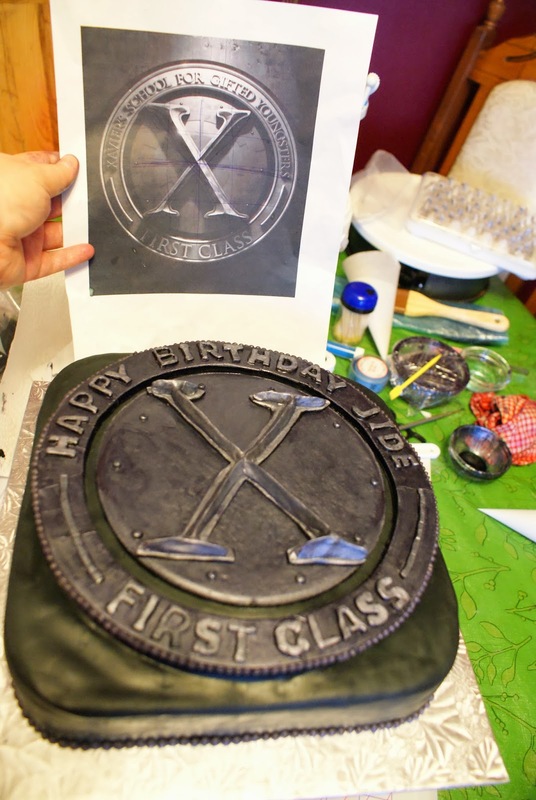 Carved vanilla X-Men: First Class cake with handmade gumpaste decor. 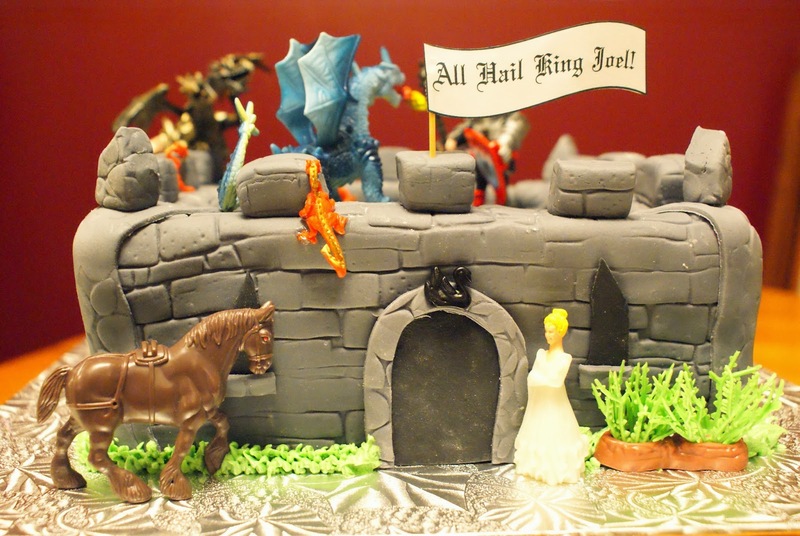 Multicoloured vanilla swirl castle cake, with handmade fondant decor and plastic medieval toys – front view. 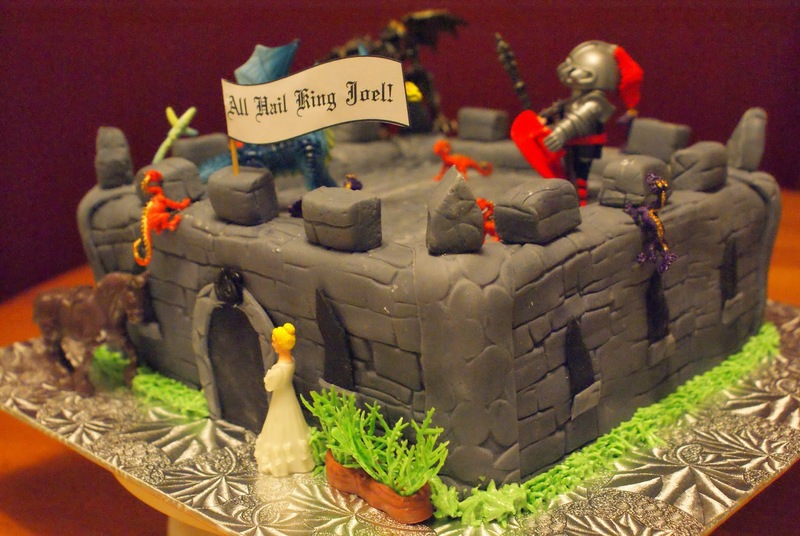 Multicoloured vanilla swirl castle cake, with handmade fondant decor and plastic medieval toys – side view. 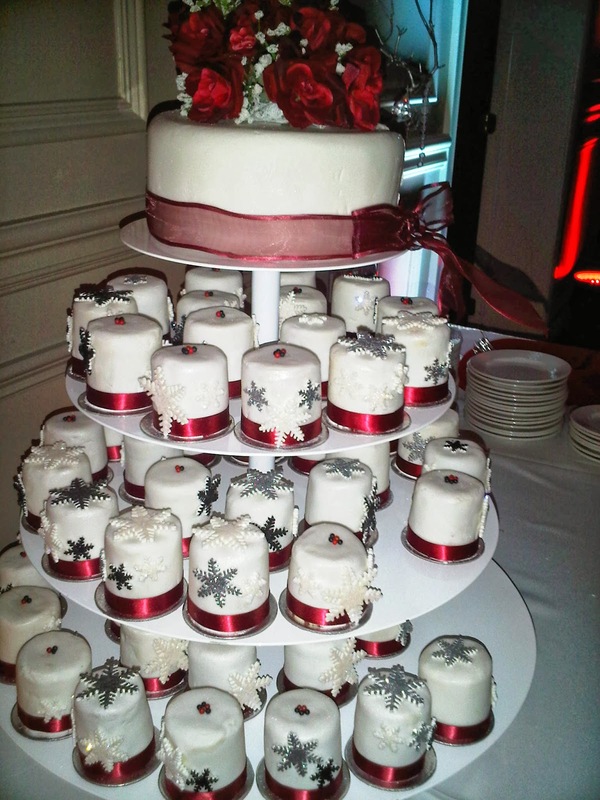 Chocolate and vanilla cake and mini-cakes, each filled with milk chocolate and vanilla filling/frosting, covered with handmade white chocolate cover and fondant over-layer, decorated with handmade gumpaste snowflakes, chocolate pearls and pearl luster. 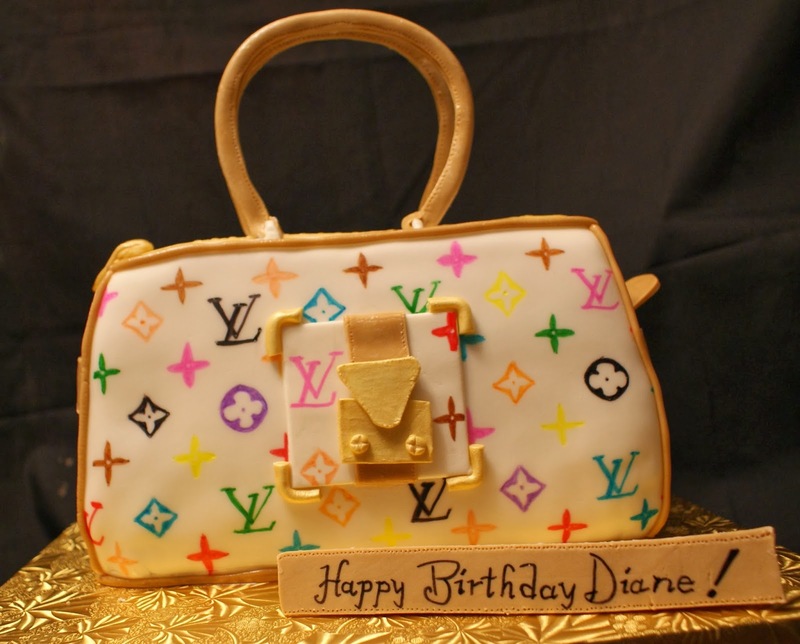 Carved vanilla handbag cake with hand-painted Louis Vuitton pattern and handmade gumpaste decor. 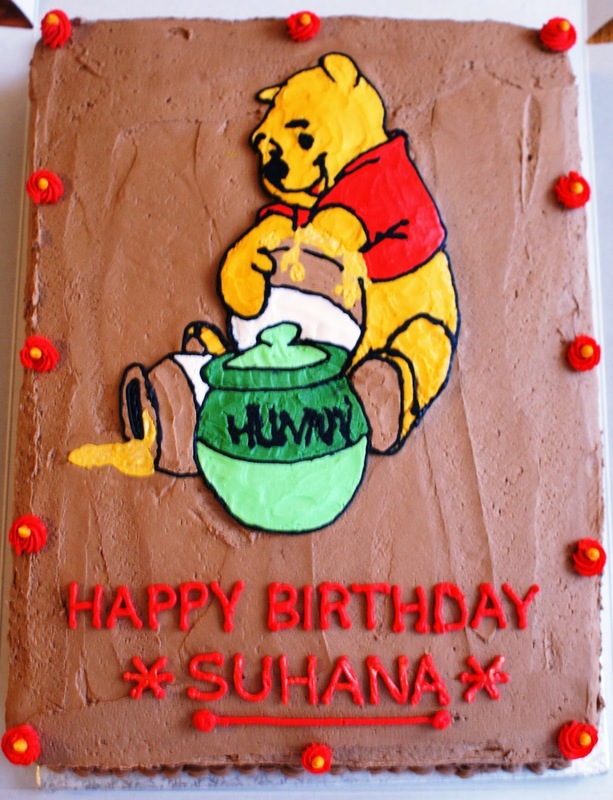 Deep Chocolate slab cake with milk chocolate filling/frosting and handmade frozen buttercream transfer decoration. 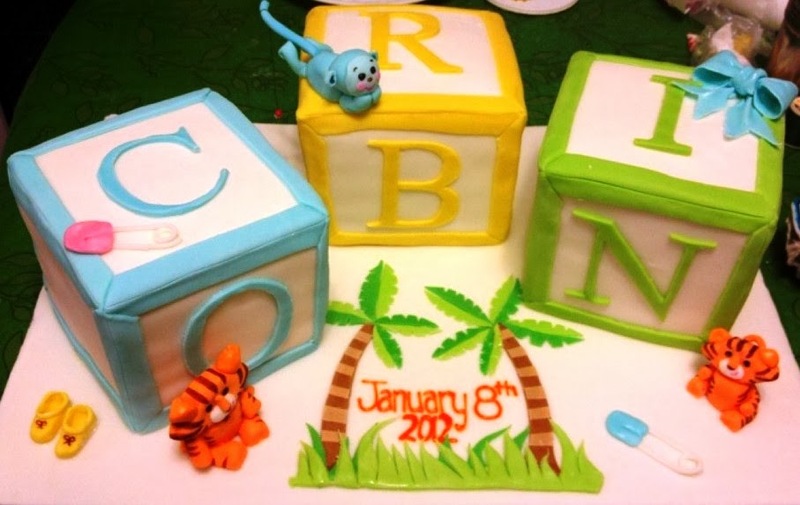 Baby Block cake (3 different flavours) with handmade fondant decor. 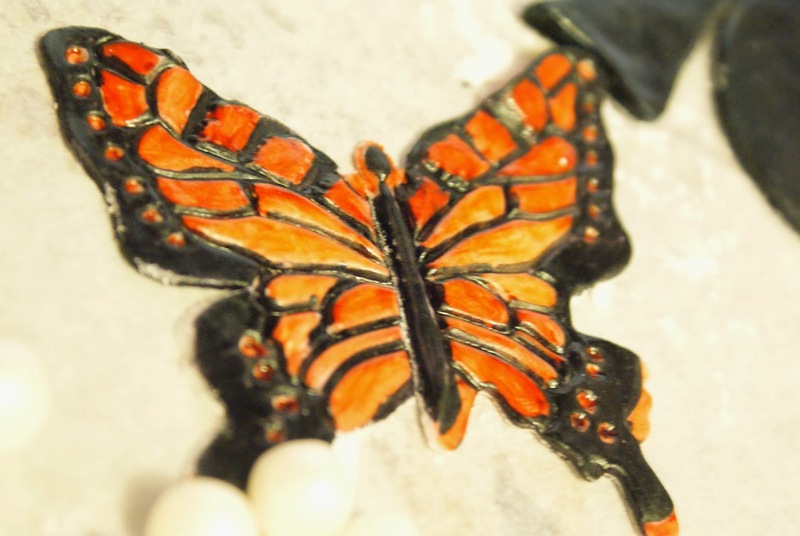 Carved Chocolate sponge cake with fondant and royal icing covering and decor. 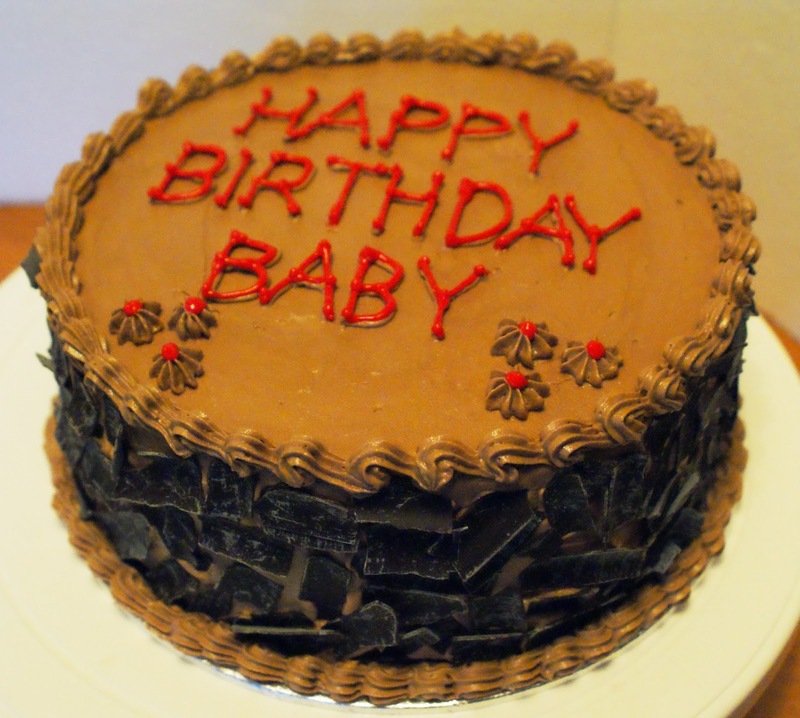 Deep Chocolate 4-layer cake with milk chocolate filling and frosting. 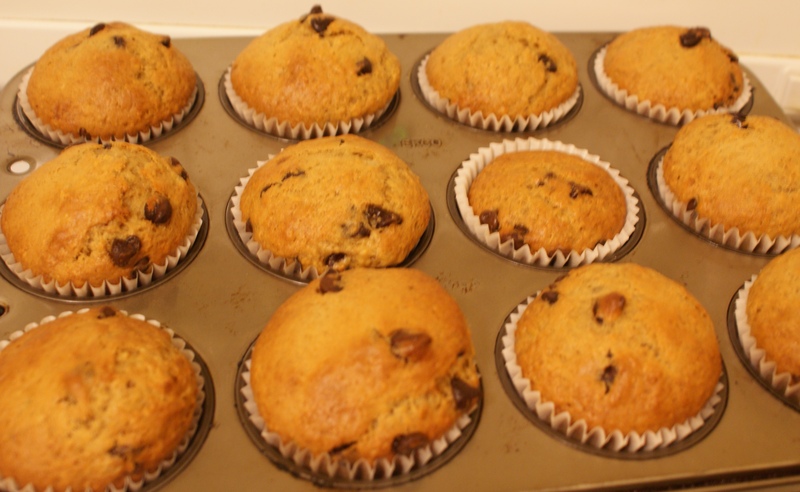 Dairy-free chocolate mud cupcakes with dairy-free frosting. 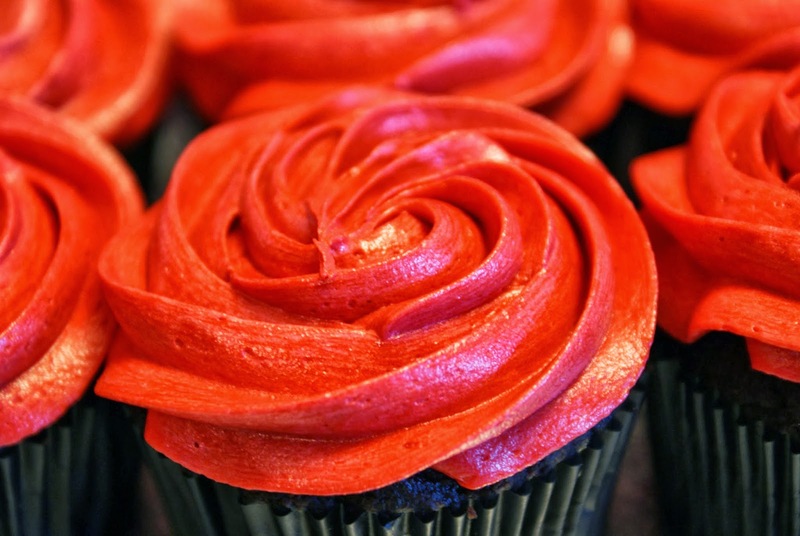 Dairy-free chocolate mud cupcakes with dairy-free frosting and decorations. 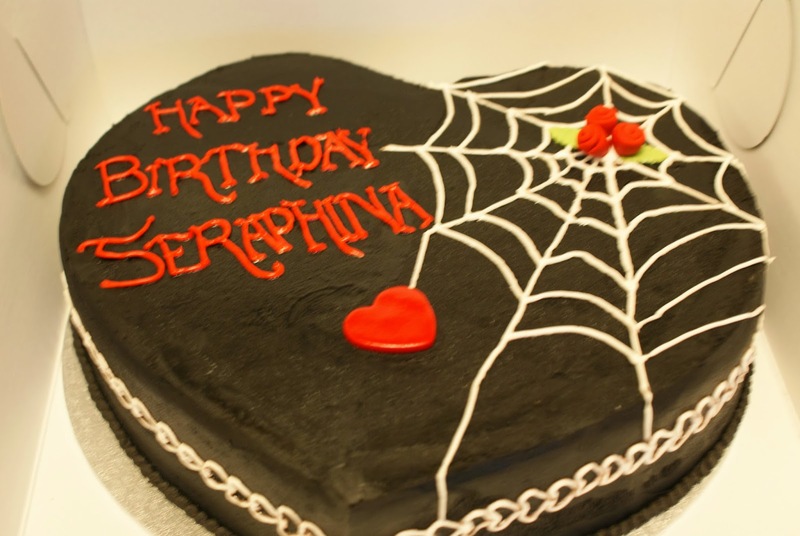 Dairy-free chocolate mud cake with dairy-free frosting and decorations. 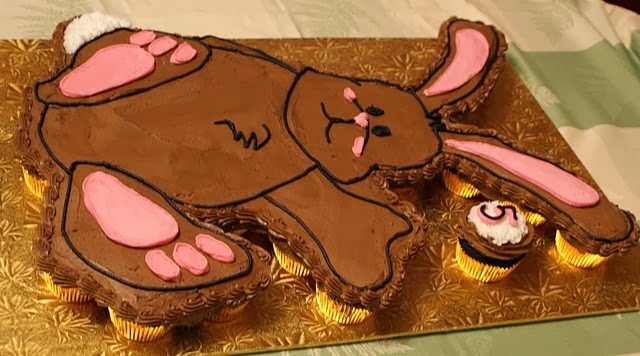 Bunny 5th Birthday cupcake cake – top view. 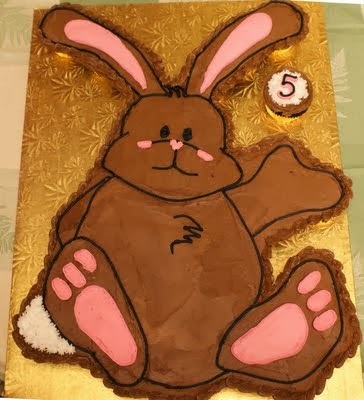 Bunny 5th birthday cupcake-cake – side view. 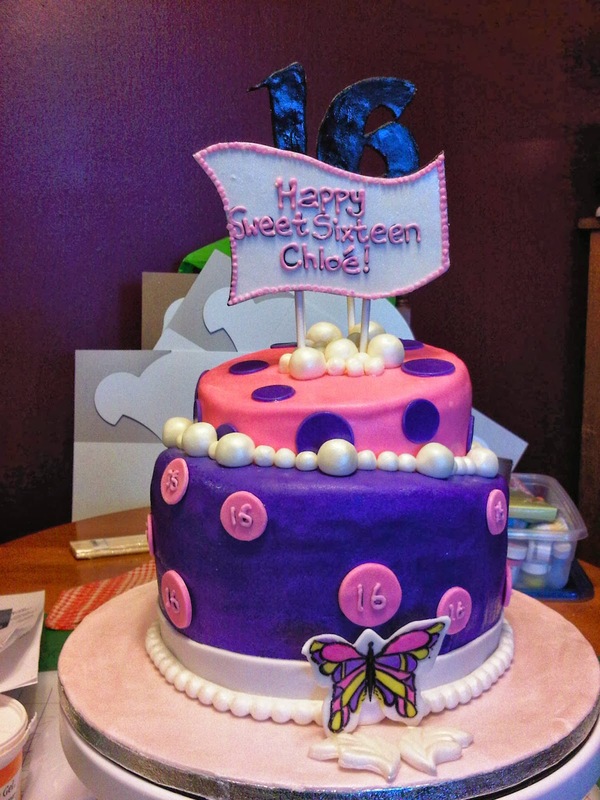 2-tier topsy-turvy cake with vanilla swirl cake and various handmade decor . 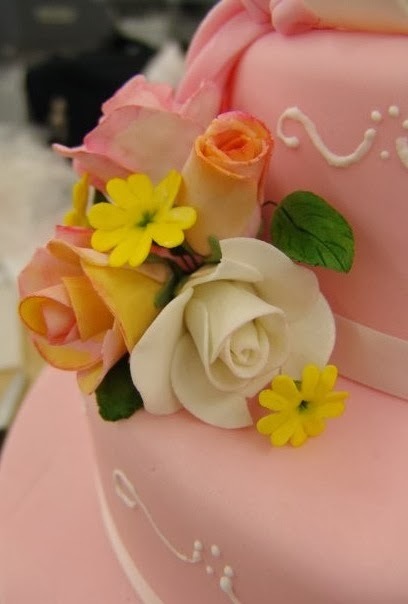 5-layer Vanilla Lemon Funfetti cake with handmade raspberry preserves and vanilla buttercream frosting..
3-Tier Bourbon Vanilla Bean Wedding Cake with fresh summer berry filling, Bourbon vanilla bean frosting, and ivory fondant cover; fresh ivory and mini yellow roses, baby’s breath and greenery entwined in a spiral around cake; small cake topper made from fresh flowers.